Swarovski Crystal iPhone 5 case with little crystal compartments in it that look pretty amazing. Transparent plastic offers a window into each crystal compartment and the little crystals have just enough room to slide back and forth. 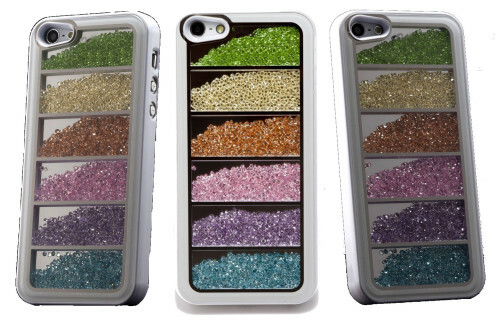 Colors of the crystals include: green, orange, pink, purple and teal (some type of designer palette no doubt). Each compartment has a little plastic window so you can see in it and enough space for the crystals to move about. Nicely designed case with cut-outs for camera lens and such. 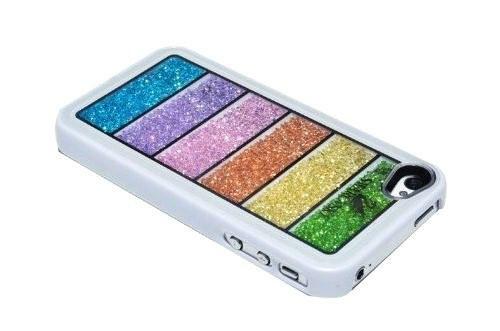 These cases come in black and white. The first clear positive is that this case really does look spectacular. The crystals move about when you do, but not so much as to look messy. Sliding back and forth basically, in a nice rhythm. It can be quite distracting to tilt the case from side to side. Its probably one of the most visually appealing iPhone 5 cases around really. The second positive with this case is that it is well crafted. It fits the phone snugly and probably would be quite protective of the iPhone were it dropped, at least in comparison to other decorative cases. It is also very much a quality case that has had quite a lot of thought put into it. There are some minor issues that have been reported about this case. Some people have reported that because the case either juts out a bit too far or the expansion around the camera is too small it creates a grey effect over photographs. There have also been some reports that this case prohibits WiFi connections to some degree by being too thick or something. Perhaps this issue is more prominent in areas with weaker connections. However, despite these objections the case seems to have a perfect rating on Amazon so it might just be a few people with their own technical issues. Tough call because the people giving it high ratings would surely rate it lower if these technical issues were real. A visually spectacular case, though some people have reported issues with WiFi and the Camera while this case is on.